An Opportunity to Make a Difference: Our First Remediation Project! The level of excitement has been growing all summer. Since Lauren Sharkey, coordinator of the Community Stream Steward Program (CSSP), first dropped off 97 native shrubs at the Zippel’s house in May, the HPSI executive have been dreaming up possible stream remediation projects. 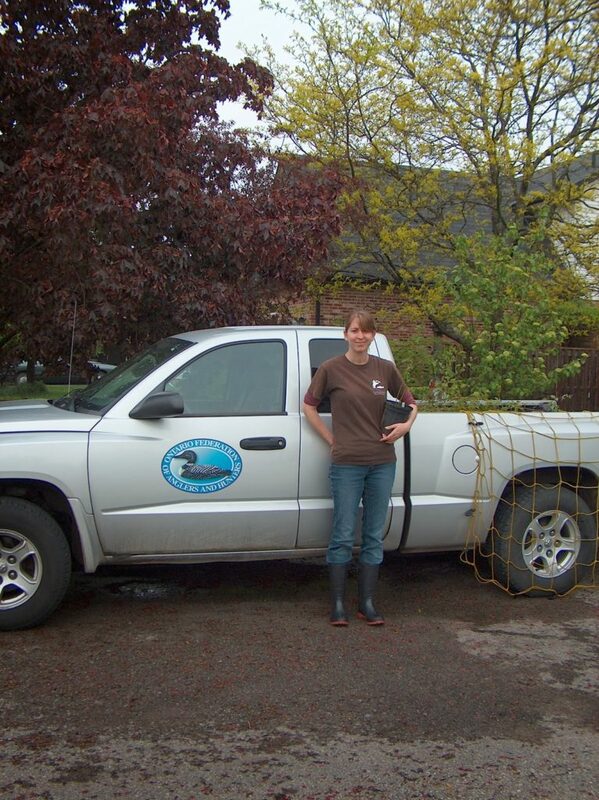 Lauren Sharkey, CSSP coordinator, poses with the Ontario Federation of Anglers and Hunters (OFAH) pick-up truck used to deliver the donated shrubs. The CSSP is a multi-partner conservation and stewardship initiative hosted by OFAH. HPSI member, Mark Zippel, helps Lauren unload the shrubs. The first steps in developing a project involved the assessment of management strategies for the Harper Creek subwatershed, followed by prioritizing potential remediation sites. 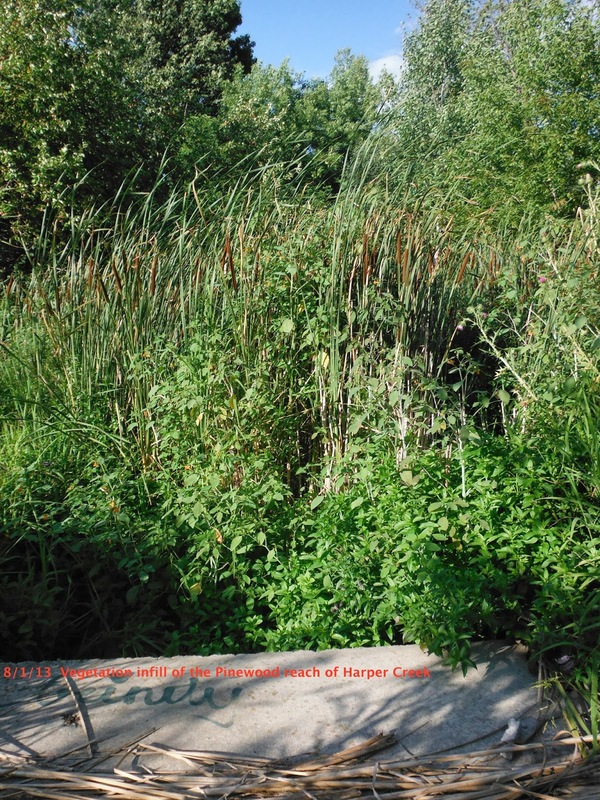 With the protection of fish habitat in mind, the HPSI focused on a short reach of the creek that emerges from a culvert on the east side of Pinewood Drive, just downstream of a large stormwater management pond. This stretch of the creek has recently experienced a lot of sediment carryover entrained within pond discharge. This reach also flows through a residential area which makes it a very visible section of the stream, and therefore a wonderful spot for community engagement in a stewardship project. 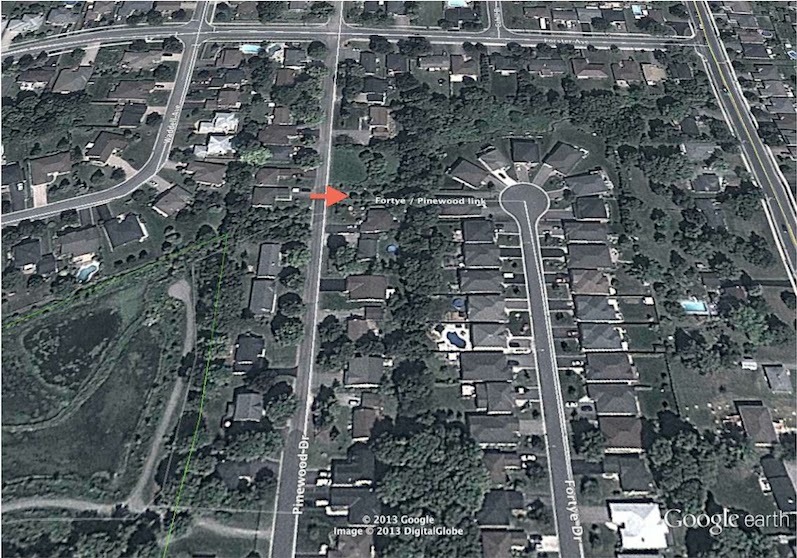 The red arrow marks the reach of Harper Creek that flows along a walkway joining Pinewood Drive and the Fortye Drive cul-de-sac. As sediment built up, it became an excellent substrate for emergent plant growth, and vegetation quickly filled in the stream, so much so, that it now resembles wetland habitat. The change between the upper photo, taken by ORCA in 2012, and the above image taken by Kim Zippel in 2013, is remarkable. In addition to sediment build-up and vegetation infill, the stormwater pond also negatively influences downstream trout habitat through thermal influences: trout are cold water fish. Due to the large surface area of the pond, significant heating of the stored water occurs between rainfalls. Following a rain event, warm water is discharged into the coldwater stream. By planting native shrubs alongside the stream, shading will eventually help counteract the impact of the warm stormwater. Furthermore, by replacing terrestrial invasive plants with native species, there is the added bonus of creating food and shelter for wildlife along the stream corridor. While narrowing down the potential remediation sites, the shrubs were cared for in the Zippel backyard. The donated shrubs are well suited to planting along shorelines and thus need to be kept moist, but they arrived in little pots full of roots! Fortunately, with the help of friends, so we could take an occasional vacation, all of the shrubs made it through the summer and are ready to be planted along Harper Creek. 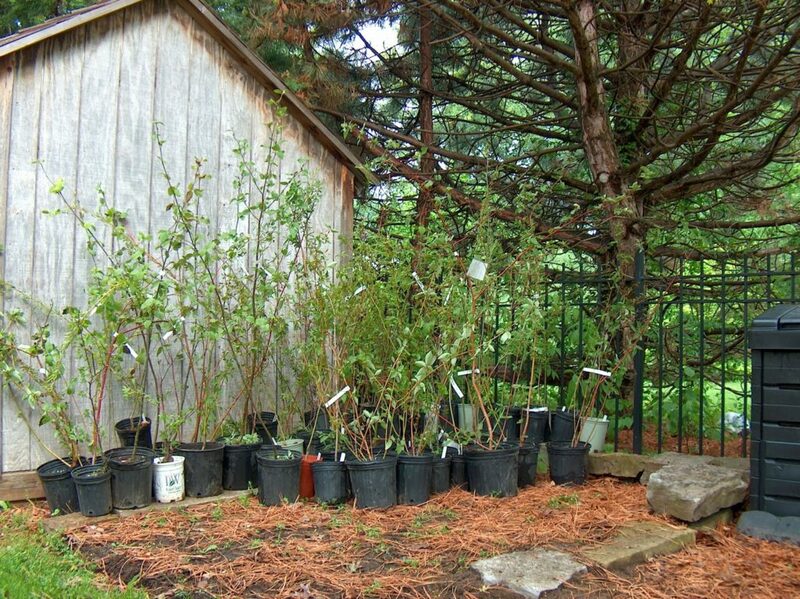 Red osier, grey and silky dogwoods; speckled alder, meadow sweet, swamp rose, common elderberry, ninebark, and button bush are among the shrubs generously donated by the CSSP for this project. 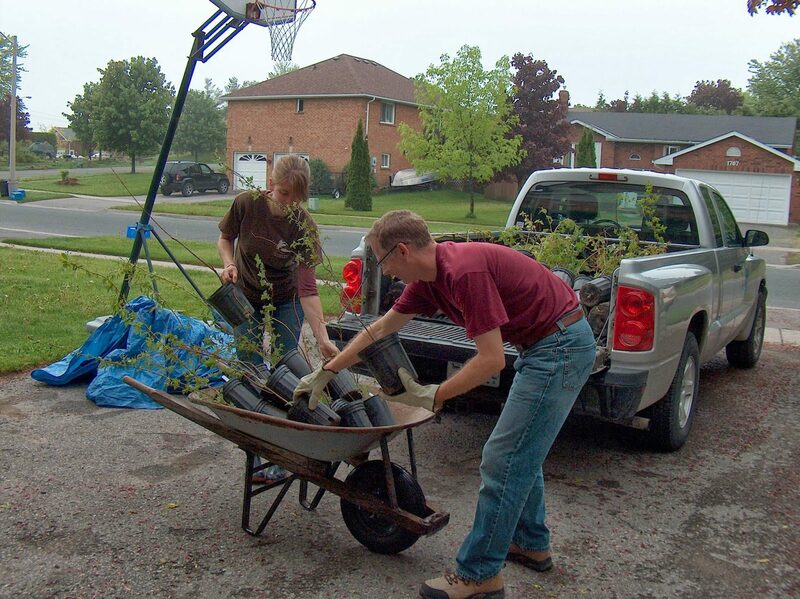 Riparian shrubs need water, and it was a team effort keeping these potted plants moist all summer. In late April, Lauren was finishing off a grant application to the Recreational Fisheries Conservation Partnership Program which provides federal funding for fish habitat enhancement, erosion control , bank stabilization and invasive species removal. Knowing that the HPSI were seeking to remediate portions of Harper Creek, she included it in her application. At the end of August, the provision of federal funding was announced. OFAH was awarded $30,000 for work on five streams containing either trout or salmon, including Harper Creek in Peterborough. The funding has allowed the HPSI and CSSP to purchase coir logs, an erosion control blanket, and native grass seed, and will also help to pay for a permanent sign to identify the stream, the project and its partners. This will be the first sign ever erected to mark the location of Harper Creek for the public! While the City of Peterborough granted approval in principal for the remediation project, all was dependent upon receiving our conservation permit from the Otonabee Regional Conservation Authority. 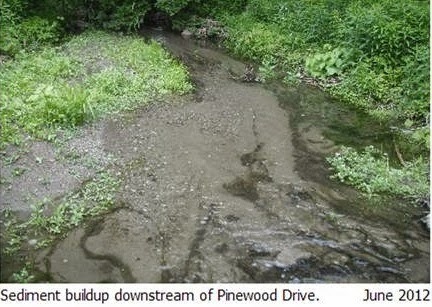 On Thursday, September 19’th, the Harper Creek Pinewood Riparian Remediation Project proposal received approval from ORCA! Work will begin on Friday, September 27th and will finish up on Saturday, September 28th. We will continue to blog the progress of this project, but we would love to meet you in person!